Jordan Spieth came up just short of winning the British Open, but sponsors couldn't be happier with the 21-year old American golfer. Jordan Spieth's bid for a Grand Slam ended just short of the 18th hole Monday, but he's still a winner. His fourth-place finish at the British Open will do nothing to diminish his marketability, say endorsement experts. "If he had won, it would have been monumental build-up to the PGA Championship in August," said Bob Dorfman, editor of the Sports Marketers Scouting Report. "The attention will be a little less astonishing now. But he's still the hottest thing going." The 21-year old American burst onto the scene this year winning the Masters and U.S. Open. He had a shot at the British Open to be the first player in decades to win golf's first three major tournaments. But when his long putt on the 18th hole missed the mark, the dream of winning golf's four major tournaments in the same year died with it. 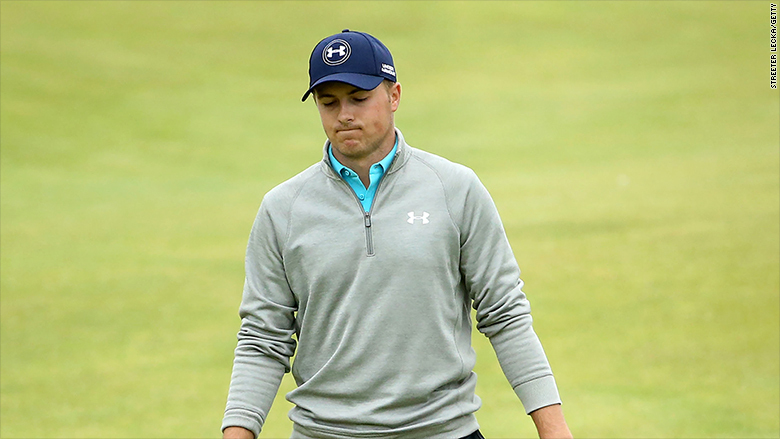 Spieth's main sponsors right now are Under Armour (UA) and Rolex. He's already making between $5 million to $7 million a year in endorsements, according to estimates. That's good money for a golfer, or any athlete who's barely old enough to drink. His agent Jay Danzi has said Spieth has been getting all kinds of inquiries from potential sponsors since he won the Masters in April. By the end of the season Spieth is likely to be pulling in $5 million to $10 million in annual endorsements, said Matt Delzell, managing director of The Marketing Arm, who negotiates such endorsement deals. "I don't think that will change at all with this loss," he said. A Marketing Arm survey found that about a third of consumers knew Spieth before the British Open, nearly double the number of people who knew him before his Masters' win. "The awareness of him will just keep going up," said Delzell. "Everything he's done has helped with sponsors, and shown he's incredibly poised."